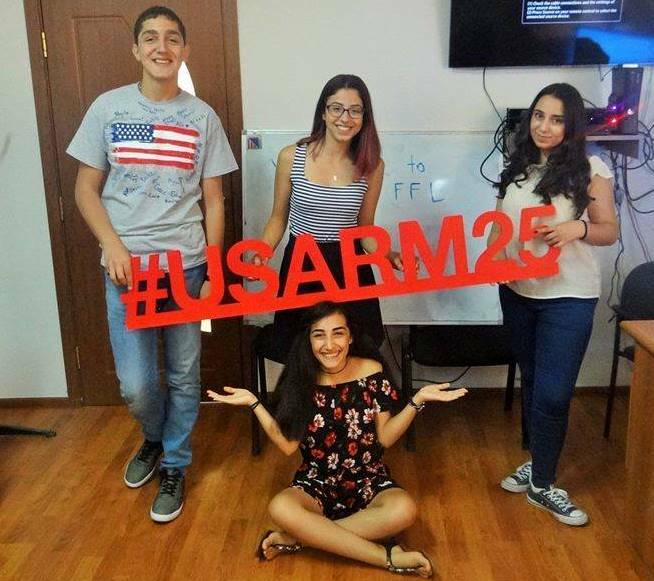 Ten recently-returned FLEX Alumni created a theme-driven clubs in one of four regions in Armenia. Each of the clubs emphasizes developing both leadership skills and English language proficiency. 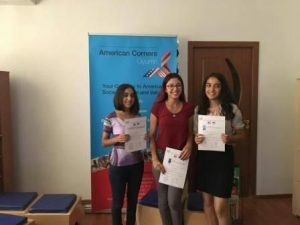 The American Corners in Gyumri, Charentsavan, and Kapan hosted the clubs and six Peace Corps volunteers served as mentors and trainers in Gyumri and Kapan. Alumni Coordinator Khachatur Margaryan ’12 helped the recently returned alumni on the right path by providing additional trainings for the alumni leaders to teach them essential club-building skills, while contributing to the development of youth education in their respective communities. Alumni Susanna Avagyan ’17, Nelly Margaryan ’17, Rafayel Khachatryan ‘17, Ani Ivanyan ‘17, and Anush Arsenyan ‘17 organized eight separate lessons for 40 students aged 13-17 with support from the Gyumri City Representative Tatev Gishyan ‘16. The alumni covered the topics of effective written and verbal communication, active citizenship, anti-bullying, gender equality, volunteering, and leadership. The alumni also shared their experiences of taking part in the FLEX exchange and encouraged participants to apply for the program. When describing her experience working with youth, Susanna says it was impressive, “… to see their growth as young people and students as well as our growth as mentors and alumni.” Peace Corps volunteers Karen Jean Hunt and Matt Swing mentored the alumni along the way. Karen hopes that all the people involved “came away with a sense of how much youth can do for youth.” Seven club participants applied to the FLEX program after attending the club, with three of them eagerly waiting for results following their 3rd round interviews. 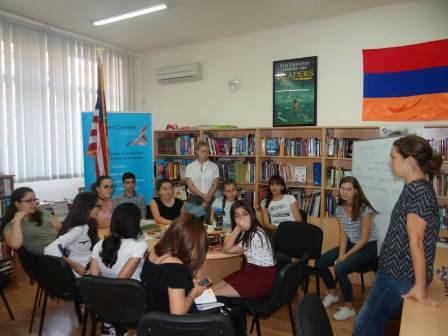 Nare Patatanyan ’17 taught a course in English as a Second Language (ESL) to 15 students aged 10-15 for two months. She covered topics such as essential communication, grammar, and vocabulary. In discussing her first experience as an ESL teacher, Nare said that, “… even though it was a little hard, it was also pretty fun and exciting.” Nare gave the students short tests at the beginning and at the end of the club and says she noticed definitive progress in both their scores on the tests and their confidence in the language. Nare believed this project to be especially important because, “… not everyone in my community can afford to pay for private English classes.” And through her volunteer work, 15 students improved their language skills and are more confident! Anzhelika Harutyunyan ’17 and Peace Corps volunteers Karrisa Kresge, Anne Stuart Link, and Anna Jackson provided fifteen students with English language lessons. Anzhelika focused heavily on essay writing skills, which are often required of students for program and university applications. She observed that the shy participants at the beginning, “… became the most active and talkative ones at the end.” Following the classes, five club participants applied to the FLEX program and four of them made it to the 3rd round. Lilit Ghandilyan ’17 and Ani Gevorgyan ‘17 held twelve meetings for thirty students aged 10-15. The students learned basic English skills by playing games and watching cartoons. In comparing the tests given to the participants at the beginning and end of the club, Lilit noted the test results significantly improved. The alumni expressed their desire to convince teenagers that self-learning can be just as effective as private classes when preparing to apply for colleges and universities. Though the meetings have ended, Lilit still sends the student language-learning material to go over on a weekly basis. The shared belief in creating opportunities connected these ten FLEX alumni, five Peace Corps volunteers, and American Corners with 100 students eager to learn and improve their leadership and language skills. Through interactive games, workshops, language and leadership training, the alumni not only created stronger connections between the youth in their towns, but also inspired their peers to share and spread values dear to the FLEX program.